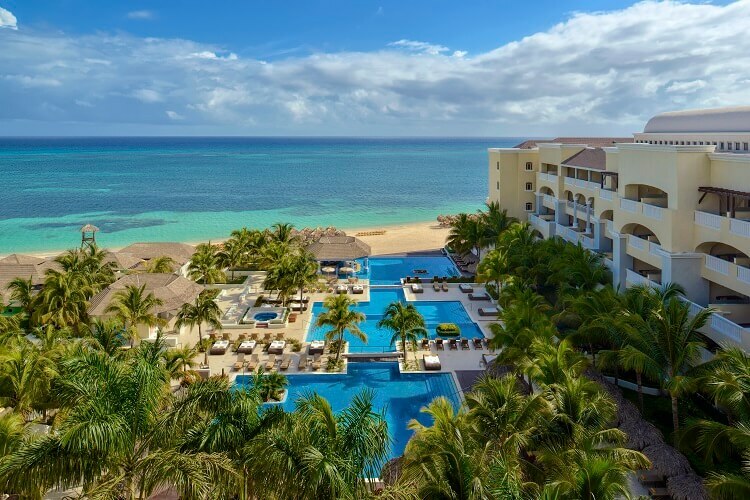 Whether you’re a couple looking for a romantic getaway, parents in need of quality time together, or a group of friends ready to make memories, an adults-only all inclusive vacation will give you an unforgettable experience! Let this ultra-luxurious resort sweep you away to paradise! Located in Riviera Maya, Mexico, the beachfront property sits among vibrant greenery and faces the Caribbean Sea to provide you with a true tropical experience. You’ll be welcomed to your beautiful, air-conditioned suite equipped with a terrace or garden. Depending on where you are in the resort, it may also come with a private plunge pool or breathtaking views of lagoons, the cenote, or the crystal-clear ocean! During your stay at Blue Diamond Luxury Boutique Hotel, you’ll find yourself daydreaming as you walk along a white-sand beach or lounge next to one of three swimming pools. If you’re looking for some activity, play a round of golf or catch some waves windsurfing! At an additional charge, you can also go horseback riding, take a helicopter ride, and venture off on a cultural excursion. Enjoy good company and light conversation over a delicious meal at Aquamarina Restaurant, Restaurant Ambar, or Ceviche Tapas Bar. There’s also a café, pool bar, and cigar lounge. 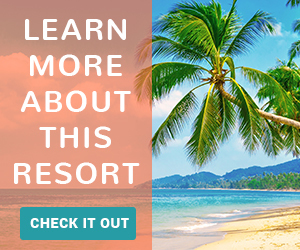 Add in a cooking class or wine tasting as the cherry on top of your perfect beach getaway! Book and SAVE on your vacation: Blue Diamond Luxury Boutique Hotel packages are available at All Inclusive Outlet. An all inclusive vacation at the award-winning Couples Swept Away in Negril, Jamaica is one for the books! 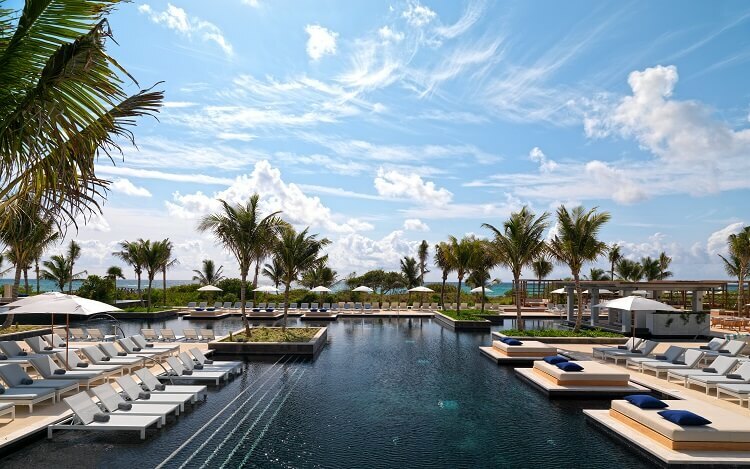 You’ll experience the beauty of world-famous Seven Mile Beach as you indulge in luxury at every turn. Surround yourself with beautiful, turquoise waters out on a catamaran cruise or on a venturous snorkeling tour! Hop aboard a glass bottom boat to witness the sea from a different perspective. You can also jump on the Margaritaville Party Bus for some fun at Margaritaville, experience a game of golf in the Caribbean, and much more. The best part is that these are included in your all inclusive vacation package! After you’ve done some exploring, the resort’s spa will be waiting to send you into complete relaxation with massages, body wraps, and body scrubs. Delicious cuisine made with fresh ingredients will satisfy your cravings. Opt for a private dinner on the beach to get your fill of extra romance. The resort also serves refreshing tropical beverages to enjoy overlooking the pool, in a nightclub, and more. And after a full day of soaking in the Caribbean sun, you can head back to your furnished suite where you’ll find a private balcony, a mini bar, and a comfortable king-sized bed to prepare you for another relaxing day in paradise! Book and SAVE on your vacation: Couples Swept Away packages are available at All Inclusive Outlet. 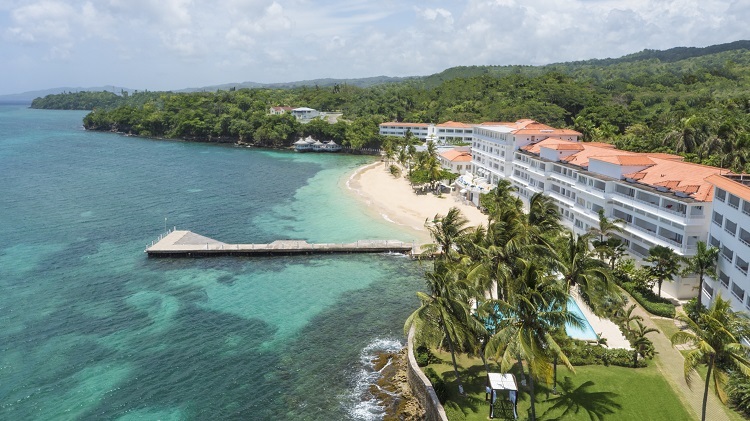 When it comes to adults-only beach vacations, Luxury Bahia Principe Bouganville delivers! This beachfront resort in La Romana, Dominican Republic will greet you with open arms as you make your way to a spacious suite equipped with a hydro massage bathtub, your own balcony or terrace, and an LED satellite TV. You even have a butler to attend to all your needs at any point of your trip! Once you’re settled, start your vacation off on the right foot at the resort’s lake-style pool or in the outdoor whirlpool tub. Santana Beach will also provide you with hours of relaxation while you mosey on over to the beachfront bar for your favorite drink! Feel like getting pampered? Hot-stone massages, steam baths, and facials are just a few of the lavish treatments available at the Bahia Spa. Once the sun sets, an exciting nightlife awakens full of shows, dancing, music, and a casino for hours of entertainment. And don’t forget about the food! Three international restaurants, six a la carte restaurants, and multiple bars throughout the resort will give you an unforgettable Dominican experience! Book now and SAVE on your vacation: Luxury Bahia Principe Bouganville packages are available at All Inclusive Outlet. Jet off on a beach getaway to enjoy the beauty of Costa Rica! When you arrive at Occidental Papagayo, you’ll immediately notice that you’re surrounded by tropical rainforests as you hear the sound of ocean waves. Enjoy some privacy as you relax in your comfortable room and admire postcard-worthy scenery from your balcony or terrace. Once you feel refreshed, feed your hunger with Italian cuisine, Oriental dishes, or at the international buffet! The resort also offers premium services, like a Shiatsu or scalp massage, at U-Spa and plenty of equipment at the gym if you want to get in a quick workout. Don’t forget to try some fun water activities on your beach vacation! Grab some snorkel gear and venture beneath the ocean’s surface to experience a colorful community or glide through blue waters in a kayak. If you’re more of a pool person, no worries! 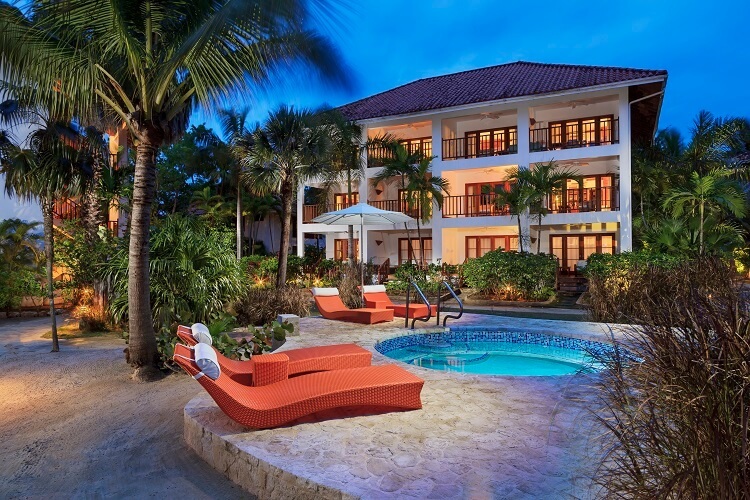 The resort has two swimming pools, including a swim-up bar, so you can soak up some rays. For adventure-seekers, offsite excursions like a visit to Arenal Volcano, horseback riding through mountains, river tours, and more are available! Just remember, these may come at an additional cost. 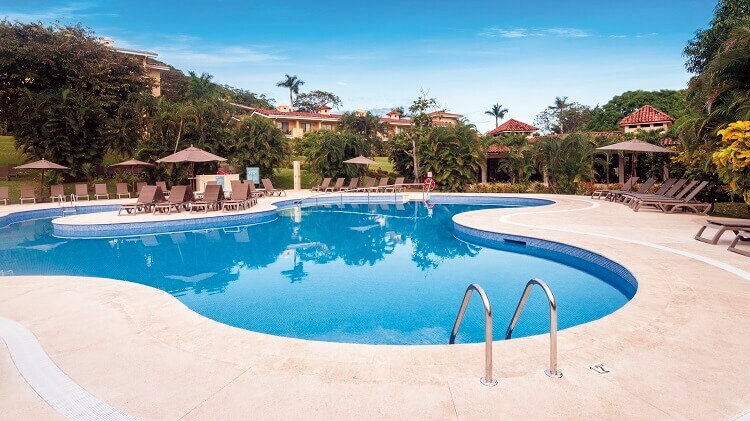 Book and SAVE on your vacation: Occidental Papagayo packages are available at All Inclusive Outlet. Romance meets luxury at the beautiful Sun Palace resort in Cancun, Mexico, making it the ideal location for a couples retreat! Toast to you and your significant other with a tropical drink next to the oceanfront infinity pool. After, you can head down to the beach and dip your toes in clear blue waters with the sun shining high in the sky! If you ever feel like you need to recharge, take to your room and soak in your double whirlpool tub. Surf and turf and international cuisine like Mexican and Italian will be waiting to fulfill your hunger. Offsite adventures will take you to places like Chichen Itza, Isla Mujeres, Tulum, and more! Although these excursions may come at an additional price, it’s well-worth the cultural experience to share with your sweetheart. At night, reveal your inner superstar at karaoke night or enjoy The Michael Jackson Show, The Circus Show, or The Tenors Show! In addition to your already amazing trip, you’ll receive quality service from the resort’s staff, who will make sure your stay is well beyond expectations every step of the way! Book and SAVE on your vacation: Sun Palace packages are available at All Inclusive Outlet. 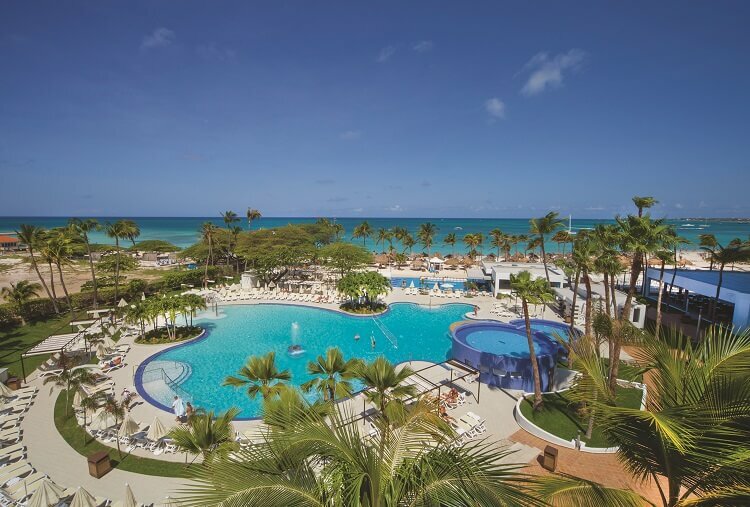 Escape to Palm Beach, Aruba for adults-only luxury at Riu Palace Antillas! The beachfront resort has plenty of suite options for you to choose from to make your stay memorable. Greet each day with a cup of coffee and some Caribbean sunshine out on your balcony or terrace. Depending on which room you’re in, you’ll wake up and say goodnight to an amazing ocean view. Get an even closer look at those sparkling waters with stand up paddle surfing, kayaking, or snorkeling! Experience delectable dining with themed buffet-style meals, a la carte dining with options like Aruban and Italian, and snacks 24 hours a day! For an additional charge, couples can add to the romance with dinner on the dazzling beach. You’ll also have access to quality beverages throughout the resort, even while you lounge by the pool. A day at the spa will ease you into peaceful bliss so your mind and body can get the relaxation they deserve. Your stay also includes free entry to the casino and the discotheque! Book and SAVE on your vacation: Riu Palace Antillas packages are available at All Inclusive Outlet. 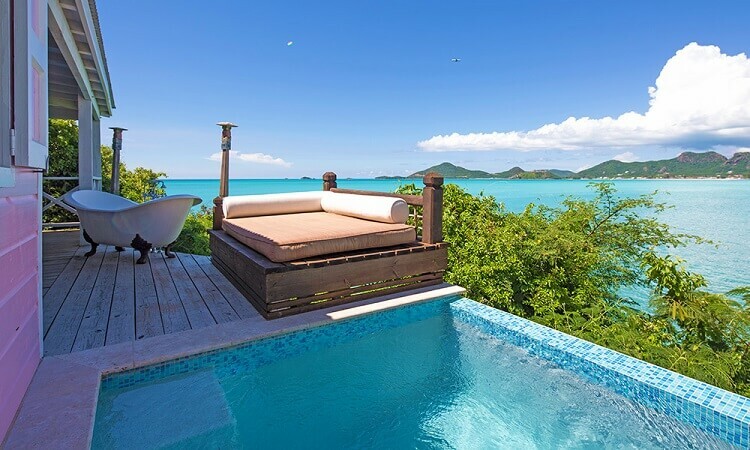 Immerse yourself in an eye-popping Caribbean paradise at Cocobay Resort Antigua! This resort makes for the ideal romantic beach vacation unlike anything you’ve ever experienced. 57 private cottages and four plantation houses provide you with an airy, home-away-from-home vibe and include a mini fridge, comfortable bedding, and a private balcony equipped with chairs, a hammock, and more! Plus, the calm, crystal-clear sea is everywhere you look, so you’ll always feel at ease. Try one of Chef Jon Bentham’s out-of-this-world meals at the resort’s main restaurant, Rafters, or at Sheer Rocks Restaurant while you enjoy a gorgeous view! Activities like Hobie Cat sailing, kayaking, nature walks, and snorkeling give you the opportunity to explore your tropical environment. You can also visit the nearby Jolly Harbour Complex for further entertainment including golf, tennis, and casinos! Just remember to check if there’s an additional fee attached. Round out your relaxing vacation with a therapeutic massage or yoga session. You’ll be sure to return home rejuvenated and refreshed! Book now and SAVE on your vacation: Cocobay Resort Antigua packages are available at All Inclusive Outlet. 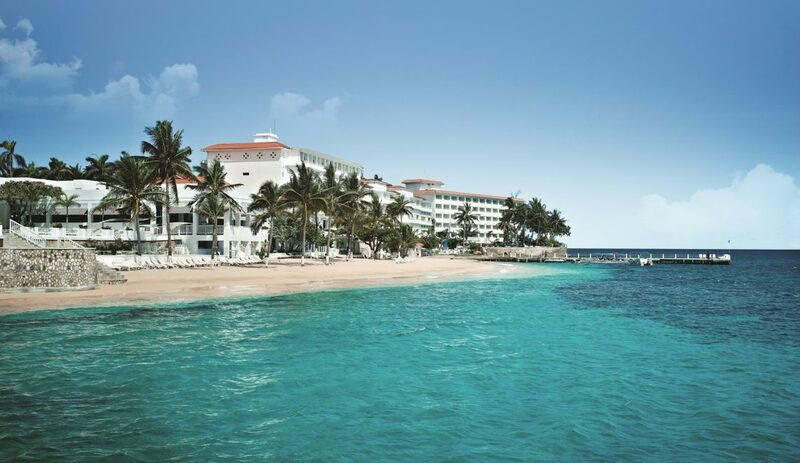 Amid Jamaican mountains and the Caribbean Sea sits the Iberostar Grand Hotel Rose Hall in Montego Bay. The minute you set foot on resort property, you’ll be welcomed by superb customer service and colorful scenery. Throw on your bathing suit and start working on your tan by the pool or on the beach! Enjoy concierge and butler service during your stay so all your needs are attended to. If romance is the name of your game, a relieving couple’s massage at the spa or on the beach will be the perfect touch for you and your significant other! You’ll always have something to do at Iberostar Grand Hotel Rose Hall. Whether it’s a dance lesson, pool volleyball, snorkeling, or tai-chi, your days will be overflowing with fun! Dining is sure to impress as well. Choose from four specialty restaurants and two buffets for international cuisine ranging from Japanese to Jamaican. You’ll also love taking time to visit one of the six bars for a wide variety of domestic and international beverages. End your exciting day in paradise by heading back to your spacious suite where you can unwind in a whirlpool tub before falling into a deep sleep on a cloud of fine European linens. You’ll be telling everyone you know about your amazing experience! 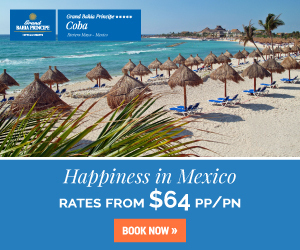 Book now and SAVE on your vacation: Iberostar Grand Hotel Rose Hall packages are available at All Inclusive Outlet. 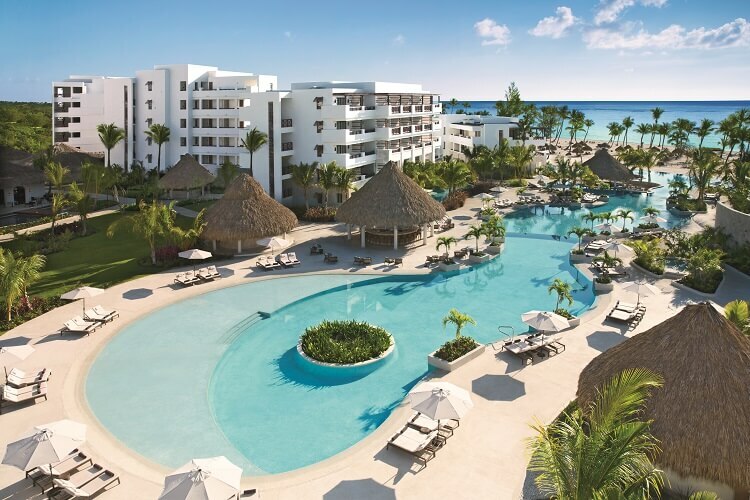 Treat yourself to the wonders of Punta Cana with an adults-only beach vacation to Secrets Cap Cana Resort & Spa! The oceanfront property is the perfect setting for anyone looking to experience endless fun. Throw yourself into a riveting game of beach volleyball or feel the salty breeze while sailing on the water. They even have big screen movies right on the beach! Couples can also walk over to the Secrets Spa by Pevonia® for Swedish massages in a romantic atmosphere. 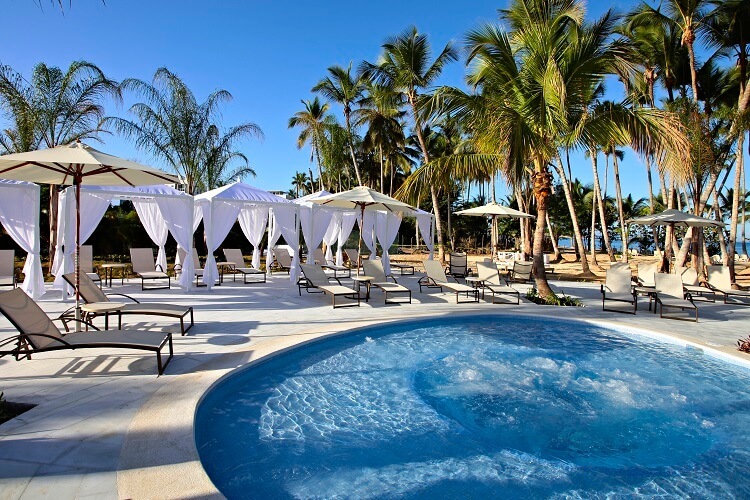 Secrets Cap Cana’s concept of Unlimited-Luxury® will satisfy every traveler looking for over-the-top treatment. 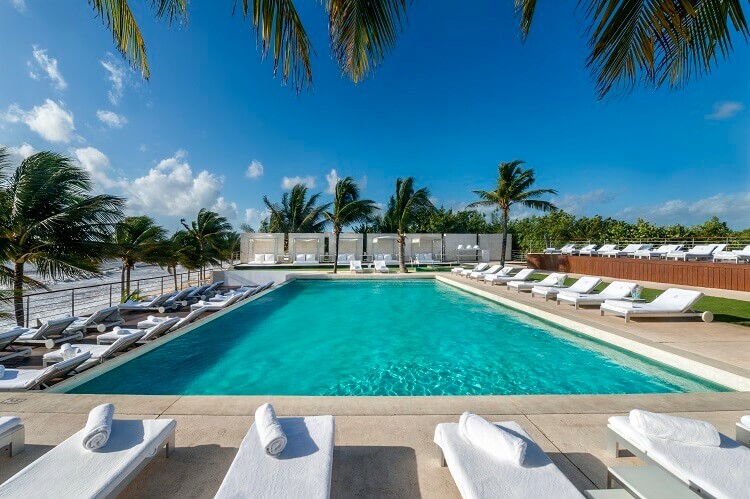 Beachside and poolside service are available so your sunbathing is never interrupted. Worried about how much you can eat and where? Don’t! You’ll have unlimited access to seven gourmet a la carte restaurants, premium cocktails, and natural fruit juices and soft drinks. An indoor theater offers live shows and nightly entertainment, and weekly theme nights will add an extra flair to your vacation. To top it all off, you can request room service at any time of the day or night while you sit out on your furnished balcony or terrace! Book now and SAVE on your vacation: Secrets Cap Cana Resort & Spa packages are available at All Inclusive Outlet. Appreciate the culture of Riviera Maya during your stay at UNICO 20 87 Hotel Riviera Maya! Choose from a spacious suite or villa where you’ll be spoiled by a local host who’s available round the clock to address all your needs. Your terrace with a lounging area will be a great spot for some quiet time before you head out for an exciting day in paradise! Play a competitive round of golf or gain a unique experience by visiting a stunning cenote (service fees not included). Three pools at the resort are available any time you just want to lay around in the sun or under a cabana, socialize, or sip on your favorite drink! Wellness is important at UNICO 20 87 with daily fitness classes like spinning, floating yoga, and tennis available to get your blood flowing. The resort’s full-service spa allows you to clear your mind and free your body from tension so you feel nothing but relaxed during your stay! When it comes to dining, you’ll be sent on a flavorful ride with cuisines like Mediterranean and Asian while enjoying different atmospheres depending on your mood. The lounges and bars are hot spots for nightly entertainment and delicious cocktails. However, if you’re looking for a more low-key evening, you can order room service without missing one of those savory meals! 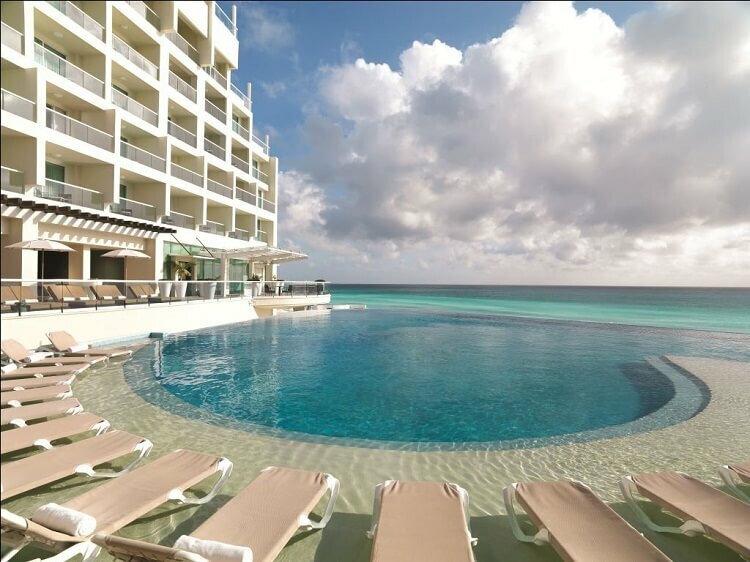 Book now and SAVE on your vacation: UNICO 20 87 Hotel Riviera Maya packages are available at All Inclusive Outlet. It’s time for you to take the beach vacation you deserve (without the kids)! 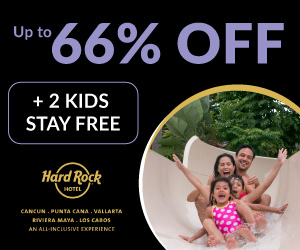 Start planning your adults-only getaway by heading to All Inclusive Outlet for the best discounted packages!